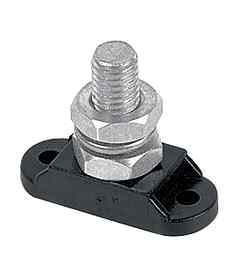 As a result of customer feedback, BEP Marine has increased the range of insulated studs and covers for 2007. This new range offers more options when making heavy duty connections. All BEP insulated studs are made with high temperature plastic bases and tinned copper (10mm 3/8”) or brass studs (6mm 1/4”).